It’s not often I wax lyrical about the men-children (it doesn’t make for the usual amusing reading) but from time to time, to be fair to my subjects, it is worth recognising their achievements and acknowledging that where there is ambition and commitment there can also be success. Two cases in point. As many would know, one of our men-children has indeed made the decision to leave school (with our support), and head to TAFE to undertake a trade course and an apprenticeship. We were naturally delighted that he conducted himself well at the interview and was successful in gaining entry to the course of his choice. He is looking forward to next year, and to focussing on something he really wants to do, with a clear end goal in mind. He is already talking about the opportunity to work on building sites during the course and get valuable experience on the job. I admire his passion and hope it translates into dedication and success. As we rightly pointed out however, don’t lose focus on finishing year 10 this year, because without it you can’t continue onto the course. Such is the life of parents, why is it we always seem to dampen enthusiasm! Having recently seen the drop out rates for trade apprentices I was momentarily alarmed. However something tells me our man-child will thrive at TAFE and find success in his chosen career. Our other man-child will of course remain at school, with plans to head to university eventually. As an aside, yes you are right to realise our twin boys are very different, both in personality and aptitude at certain tasks. Hence one is happy to remain at school and most likely head into a business course, and one is off to trade school so he can work outdoors. Naturally, in remaining at school, one son is continuing rowing, something which they both excelled in last year. Of course this season, it’s a whole new level of intensity, as it’s “open squad” for Year 11 and 12 boys, and now very, very serious. So whilst we thought last year’s training schedule was demanding, this year’s is incredible. Two early mornings a week, two afternoons a week, lunchtime gym sessions 5 days a week, and a 50km row on a Saturday up the Maribyrnong River (and that’s their light training program)! 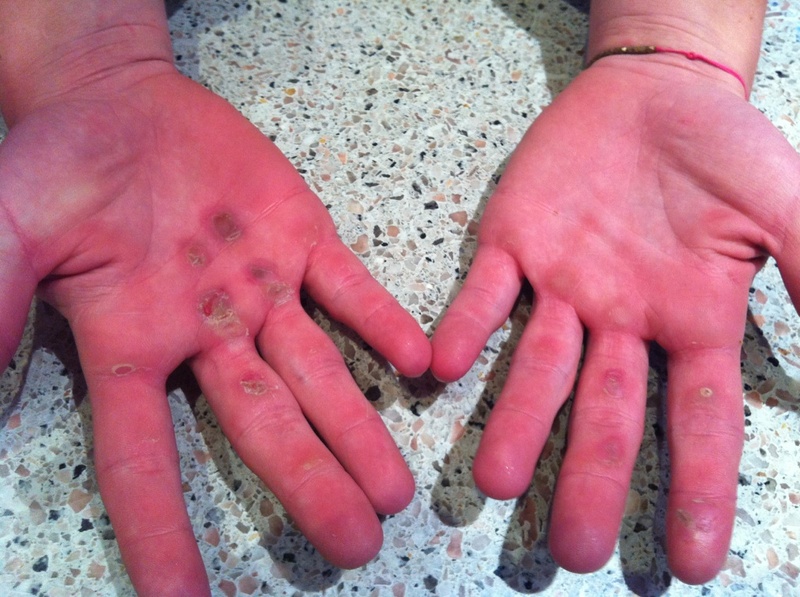 As you can see, the blisters on his hands are just starting to heal, and the skin harden, as they do at the start of each season. Apparently his hands look good compared to some of his friends! My son knows what he wants to achieve and is working hard to get it. Each seat in the skull is highly prized and sought after. He has his sights set on rowing in the “seconds” this season and hopefully sharing in the ultimate prize of a spot in the “firsts” the following one. With determination and continued development we hope he achieves his goals. But we are already proud of him! I do take my hats off to the boys that pursue rowing at this level. The demands are enormous, physically and mentally, and totally time-consuming. It impacts their working life (you can almost forget a casual job), their social life (good news is they forego alcohol), and their school life (reduced time for homework) and eats into their holidays with camps and more personal training. In doing so, it also teaches them the importance of the commitment that is required to pursue sport at a high level, and the sacrifices elite sports people make on a regular basis.